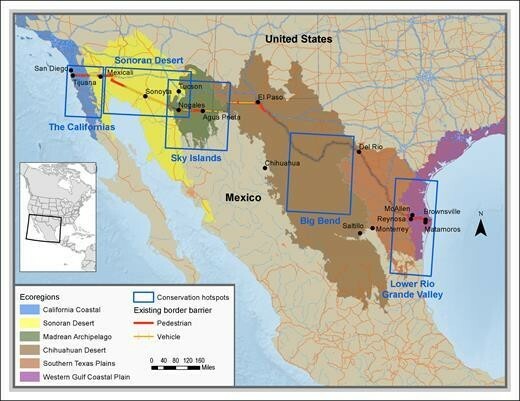 The proposed US-Mexico border is predicted to cause disruption to animal migration. Q: What makes these border regions special? A: Dirzo - This area is an ecological theater where evolution has engendered a plethora of plays. A multitude of factors—climatic conditions, topography, geological history, soil types—converge to create an amazing mosaic of ecosystems. Q: What impacts have border wall construction had so far on biodiversity? A: Ehrlich - Any substantial construction ordinarily forces populations to extinction directly by outright destruction of their habitat or by reducing population size or restricting access to critical areas required seasonally. Q: What are the ways in which border wall construction specifically threatens one species? A: Dirzo - Many species, such as bighorn sheep, are composed of populations of relatively few individuals per unit area and have large home ranges—hundreds of square miles in the bighorn’s case. Shrinking that range will lead to local population loss or declines. Q: You estimate that 17 percent of the species you analyzed risk extirpation within the US if cut off by a border wall. Why should the average person care about this potential loss? A: Ehrlich - Aside from effects on water flows and other natural services, the wall could rob us of iconic creatures such as the endangered Peninsular bighorn sheep and the Sonoran pronghorn antelope.